This big Young's pub has a prime site on Clapham Common. This big Young's pub has a prime site on Clapham Common (though with no views of the common; it faces the busy A road). 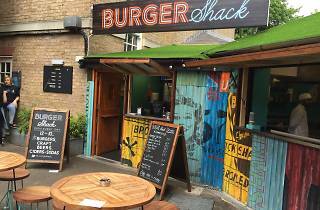 In the summer of 2015 a burger shack was added in the front garden, rather unimaginatively called Burger Shack, which is good for al fresco dining. There are also rooms above the pub, run as a small hotel. It was one of those damp October Sundays where I think the whole of London wanted a roast. Food was ordered and came pretty quickly, nice additional of courgette on the roast but I would have like more veg, good roast potatoes, gravy, beef and Yorkshire pudding was ok.
Really nicely decorated inside, a bit gothic-y and comfy chairs to sit it. They often have lively events going on and outdoor pop-up stands. I came here one Sunday for a roast dinner. When the food turned up about 30 seconds after ordering I knew instantly that it must have been microwaved but rather than pre-judging I thought to give them the benefit of the doubt perhaps they had done the impossible and come up with a way of making food taste great straight out of the microwave. Alas they have not. the giant yorkshire pudding was soggy, the potatoes tasted starchy and the meat was dry. It's a nice place to come for a drink but don't bother with the roast dinners! Great lively pub! I have been here a few times after some friends have played sports on the common. There is a really nice vibrant vibe going on, you can eat food from the pubs restaurant or grab a burger or pulled pork curly fries (which I can confirm are delish!) from the burger shack outside. I nice place to go for the afternoon or some drinks before heading out to the high st. I beg to differ from the other reviewers here. Our experience was of staff who could not care less about their customers. Such a beautiful pub with great food and a living etc worthy decor. I have been for Sunday lunch and dinner during the week and I have been beyond happy with my food and service both times. The Sunday lunch is not cheap but I believe that you get what you pay for and the meat was great quality and I have eaten so many greasy and bland pub Sunday lunches that I am happy to pay more for a decent one. Save space for pudding as the sticky toffee pudding with salted caramel ice cream is well worth the calories. GREAT PUB AND HOTEL USE TO EAT THERE ALOT THEN COULD NEVER FIND IT TURN OUT I WAS ON THE WRONG SIDE OF CLAPHAM COMMON FOUND IT WAS TWO minutes from a friends house we had sunday lunch and it is still amazing can't wait to visit again soon. 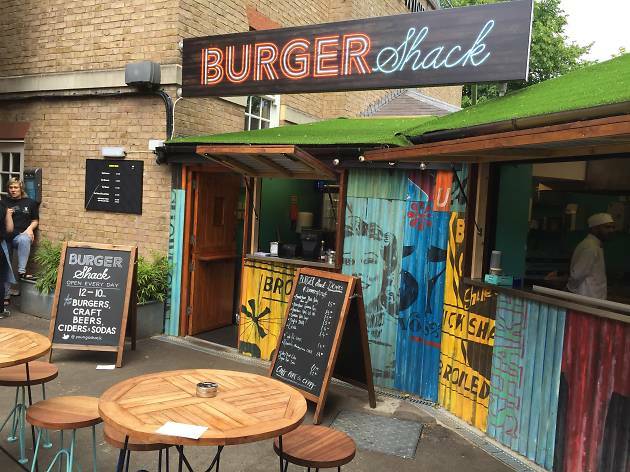 Fantastic well run business in the heart of Clapham Common. Live music, great food and dog friendly. An easy 5 star vote for me and proud to have this as our local pub! Ace gaffer, gorgeous Pub Dog, Max, the BEST burgers, beautiful rooms, awesome service! It really ticks all the boxes and more: traditional pub setting but modern and tidy. Exceptional modern pub/restaurant menu. Super friendly staff + a managing pub dog! Simply the best place to hang out in Clapham! Great management team and Max keeps everyone in line with his exceptional customer service skills! Great location on the Common, very spacious and loads of beers to choose from! I love the attention to detail in the decor, the quirky things which catch your eye, the wonderful breakfasts and the fantastic vibe in the evening. Great pub on the common! Delicious roast and the Burger Shack is great! Er, rather odd image to include for this one! But it's a great option for a pub if you are around Clapham Common. It's pretty much slap bang in the middle of Clapham Common and Clapham South tube stations so you'll have to take a 10 minute walk in either direction or hop on a bus if you get off there. Once inside, it's a veritable rabbit warren of rooms to explore and lengths of wooden bar to prop up. There is often sport playing on the TV's and it's dog friendly - look out for a water bowls dotted about about the place. Even when busy, the staff were friendly and the drinks were reasonable. We will go back. This is a fantastic option for Sunday lunch. Hearty portions, delicious food and a great ambiance. I had the lamb and it was stunning- thick slabs of juicy meat, with delicious roast potatoes and the obligatory Yorkshire puddings. One of the best roasts I've had in London.